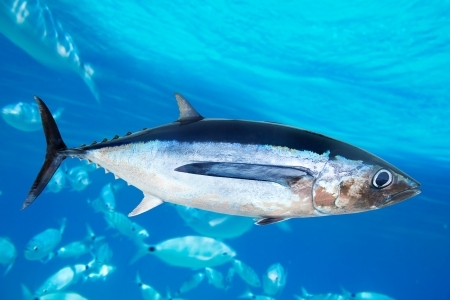 The albacore is a species of tuna found in all three of the world’s major oceans as well as the Mediterranean Sea. It’s a popular source of tuna for canning – the history of tuna canning goes back to 1903 when 700 cases of albacore were experimentally canned. In the US it’s the only species that can legally be described as “white meat tuna”. The canning industry use this phrase to distinguish albacore meat from other tuna species. It’s also known as longfin tuna. This is because of the long pectoral fin running down its side, for up to 30% of the total length of the fish. Like all fish it accumulates methylmercury over time, but as it’s an apex predator (at the top of the food chain) it does so to a greater extent than most fish species. Although the human body does naturally break methylmercury down over time, it takes over a year to do so. Albacore caught individually by pole is reckoned to be the most sustainable form of tuna, so look out for it when shopping.